In conversation, you can hear him talk about how Nick Saban has done everything you can do at the college level and how the NFL Super Bowl might be next on the bucket list. 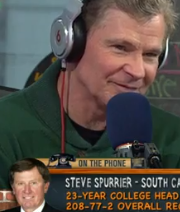 We know how that worked out for Steve Spurrier... Not very well. I think is a lot of wishful thinking on behalf of the Ol' Ball Coach, because I think that Nick Saban actually likes what he's doing here at Alabama. Here's nice article on this topic... And the video is below.